If you're like most budding engineers, you want to see how your design matches up against another engineer's. The competition makes you work a little harder. 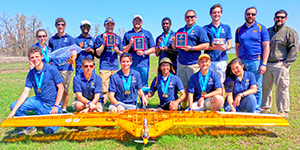 In the Georgia Tech School of Aerospace Engineering, you'll have the opportunity to compete for the sheer fun of it..
You can also compete for academic credit. Design competition classes (AE 1355, 2355, 3355, 4355) can be incorporated into your degree plan to earn free elective credit. 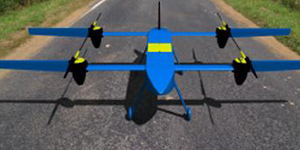 The specific topics vary, but there are generally courses that focus on aircraft, spacecraft, helicopters, and gas turbine design. 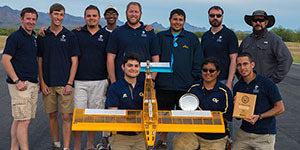 The competition rules are set by national organizations such as AIAA, AHS, NASA, or SAE. Our student teams compete against their counterparts nationwide. The Georgia Tech Design Competition program, available as free elective credit under the AE *355 Design Competition series of classes, will give you the chance participate in every phase of a vehicle’s evolution - from rules screening and conceptual design, through vehicle sizing, detail design, prototyping, and flight testing.This is a highly multi-disciplinary design problem requiring the balance not only academic studies, but sponsor recruitment, personnel management, resource allocation, and progress reporting. To find out more about how you can participate in these annual competitions contact the sponsoring organizations or talk to your advisor.